Is there anything more frustrating than slaving over your hair all morning, only to have it fall flat around lunch? We don’t think so; that’s why we’ve gathered the #VanFam to discuss tips that can help extend the life of your style. In this #StylistSecrets blog entry, we’ll discuss three helpful tips to turn your good hair morning into a good hair day! Hands off! We know that it’s tempting to run your hands through your luscious locks, but touching your hair will only build oil at your roots, making your blow dry fall flat. Use the right amount of product. Preserving your style shouldn’t take an entire can of hairspray. Too much product will weigh down and flatten your style. Use high quality products. Our Stylists recommend Kerastase Laque Dentelle and True Grip for all day hold. Of course, when all else fails, have a plan B! 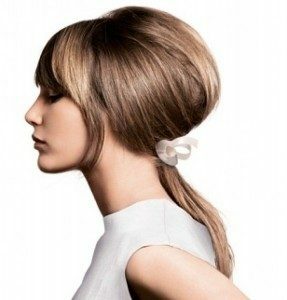 If you see your style falling flat during the day and you have an evening event to attend, try out this easy and elegant sixties low-pony. The key to pulling off this look is making sure to add volume at the root so that the style looks intentional. We want to answer YOUR questions in our next #StylistSecrets blog entry. Leave your question in the comments section below or use #VanityStylistSecrets on your favorite social media network to submit your question! Salon Vanity is a Philadelphia Salon located on the corners of 17th and Walnut in Rittenhouse Square. Want more gorgeous? Stay up to date with all things hair by following us on social media!